Dimensions 0.75 by 6.75 by 10.50 in. 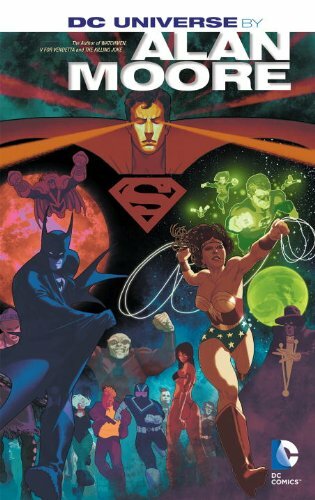 Amazon.com description: Product Description: Don't miss this comprehensive collection featuring the World's Greatest Super-Heroes as interpreted by one of the most acclaimed authors in comics! The work of Alan Moore (WATCHMEN, V FOR VENDETTA, THE LEAGUE OF EXTRAORDINARY GENTLEMEN) in the DC Universe during the 1980s is considered a benchmark for great stories with fresh approaches to iconic characters. Collected in this volume are all of Moore's Superman and Batman stories, including "Whatever Happened to the Man of Tomorrow?" and so much more. Collects ACTION COMICS #584, BATMAN ANNUAL #11, DC COMICS PRESENTS #85, DETECTIVE COMICS #549-550, GREEN LANTERN #188, THE OMEGA MEN #26-27,ÃÂ SECRET ORIGINS #10, SUPERMAN #423, TALES OF THE GREEN LANTERN CORPS ANNUAL #2 & 3, SUPERMAN ANNUAL #11 and VIGILANTE #17-18.